More than 200,000 civilians have fled the city of Afrin in northern Syria in less than three days to escape a Turkish-led military offensive against a Kurdish militia, a war monitor said Saturday. "There was fierce fighting throughout the night on the northern outskirts of the city as the Turkish forces and their Syrian allies tried to break into the city," the Syrian Observatory for Human Rights said. 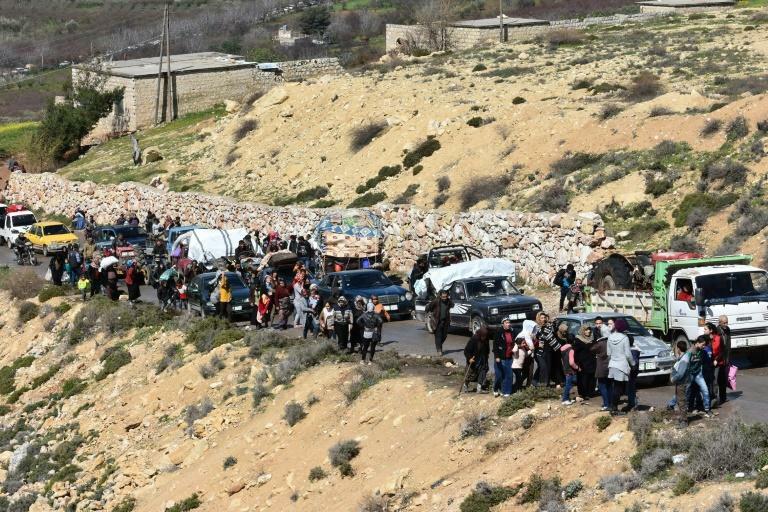 The exodus continued on Saturday with at least 50,000 civilians fleeing the city since the early hours of the morning, according to the Britain-based monitoring group, which relies on sources inside Syria for its information. "The situation is terrifying," said Observatory director Rami Abdel Rahman. Turkey and its Syrian Arab rebel allies have waged a nearly two-month offensive on the Afrin enclave, which is held by the Kurdish People's Protection Units (YPG). Earlier this week, they largely surrounded the enclave's sole city, which was home to some 350,000 people, including people displaced from other parts of the enclave already overrun. A single escape route remains open to the south to territory still held by the YPG or controlled by the Damascus government. "Civilians are fleeing through the southern corridor," Abdel Rahman said. The YPG has been a vital partner for a US-backed coalition against the Islamic State jihadist group. But it is seen by Ankara as a "terrorist" offshoot of the outlawed Kurdistan Workers' Party (PKK), which has been waging an insurgency inside Turkey since 1984. Afrin has come under heavy air and artillery bombardment by the Turkish army. On Friday evening, a Turkish bombing raid struck the city's main hospital, killing 16 civilians, a monitor said. Turkey's military denied hitting the hospital, saying that its operation in Afrin "is carried out in such a way as to not cause any harm to civilians". Hospital director Jiwan Mohammed told state news agency SANA that the strikes had severely damaged the facility and put it out of service. Serwan Bery, co-chair of the Kurdish Red Crescent, said earlier it had been the city's only functioning hospital.